Home On a Shoestring Leadership and Management Do I Still Need Business Cards for Networking? 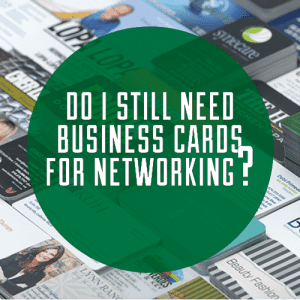 Do I Still Need Business Cards for Networking? Technology has improved the way business is done in more ways than anyone could count. It has nearly killed snail mail and replaced it with email. It cut costs on making copies or printing bills and invoices. But, there’s one business aspect that technology has yet to replace: business cards. When it comes to face-to-face networking, professional business cards are still important, relevant and necessary. Business cards are a vital aspect of networking, standing out and being remembered. What makes business cards so important? Are you convinced you really still need them? Check out these 4 reasons why you absolutely still need business cards. Whether you’re naturally introverted and need to muster up a lot of courage to reach out or you’re an extrovert who doesn’t have too much trouble starting a conversation, business cards are the perfect icebreaker. At a conference or trade show, business cards provide the perfect opportunity to introduce yourself and your business. Once you hand out a business card, you have the opportunity to make a short sales pitch about yourself, what you do and what makes your business special. Even outside of a professional setting, business cards are a great way to naturally open networking avenues, start conversations, begin building relationships and expand your reach beyond just your professional industry. Exchanging information without a business card is difficult, time-consuming and will likely include an error or two. But, with a business card, you can hand over all of your most important information — from your mobile phone number and email to your Twitter handle — all at once, without risk of an error or misunderstanding. A business card will also save potential clients or customers a lot of time when they decide to contact you. Instead of digging for your information, they’ll have everything they need to reach out right on your business card. Whether you’re at a trade show or you’re just talking with a group of new acquaintances, having a business card to hand out shows that you take yourself and your business seriously. Once the conversation gets going and your business is brought up, not having a business card to hand out shows a lack of professionalism. While you could still give out your information on paper, a well-designed, high-quality business card shows the highest level of professionalism. While your website and web traffic bring in a lot of referrals, business cards don’t hurt either. When you hand out business cards, be sure to give out more than one. Even if the person you initially give your card to doesn’t follow through, he or she might hand it off to someone else who’s interested in your products or services. Also give out your cards to satisfied clients so they can recommend your products and services to their colleagues as well. Though online networking is important, face-to-face networking is far from dead. A good stack of business cards is absolutely essential for effective in-person networking. A business card provides a tangible way for potential clients and customers to remember you in a way that online networking can’t always replicate. Amy works in marketing and digital strategy for a startup in Indianapolis. You can connect with Amy on Twitter, Google+, LinkedIn or Pinterest.